As family gathers around the table this season, don’t stress about not having enough matching dishes and silverware. Guests from different beliefs and backgrounds will come together to celebrate, so who says the table settings have to be uniform? A mismatched table is a trendy look that can work well with a few simple design tips—and will provides a backdrop for a meal where memories are made. For a mismatched table, each place setting should be mismatched, not just a few, so the mismatching won’t look like an afterthought. A variegated look can be as informal or formal as you like—use the good silver and full place settings if you wish. It just doesn’t all need to match! Mismatched doesn’t mean haphazard. By using common design elements such as a similar color scheme throughout, the table will feel inviting and intentional. 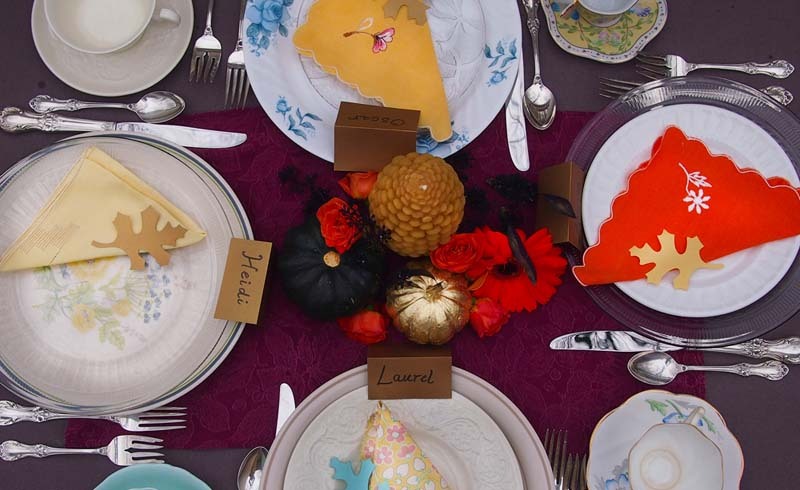 Unify the look with a finishing touch such as matching place cards to pull it all together. Making name cards is a job children can help with, too. Tie in elements of fall. 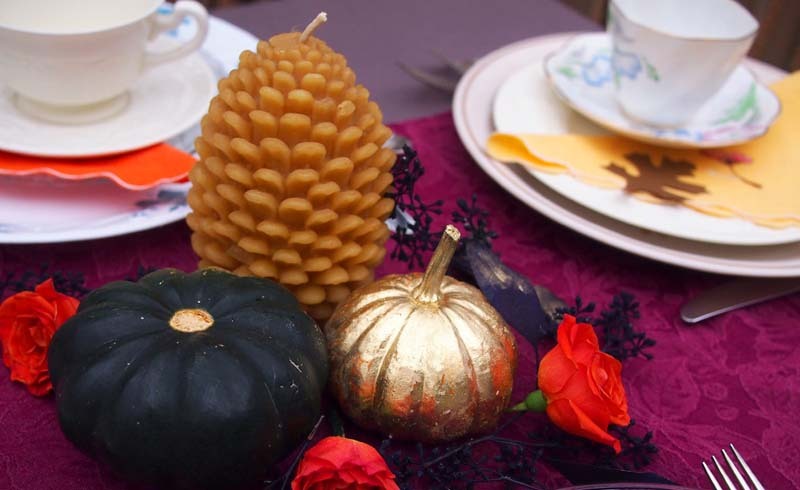 Brown tones and gold hues look wonderful on an autumn table. Metallic is hot in décor right now and has a festive, seasonal look. 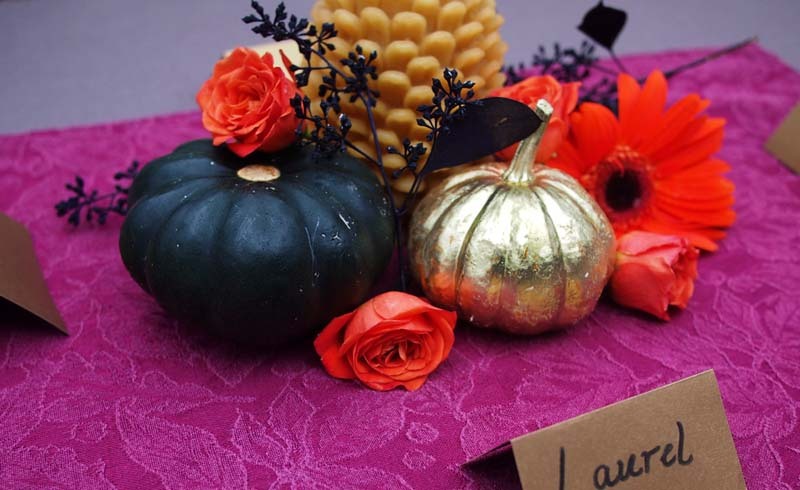 Squash and gourds from the garden can dress up a table for an easy centerpiece, either spray painted or left natural. 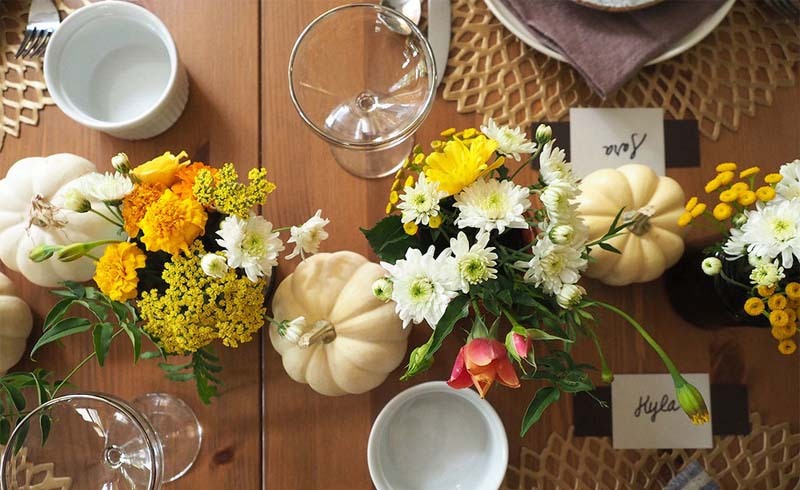 Simple centerpieces put the focus on the variety of your place settings. 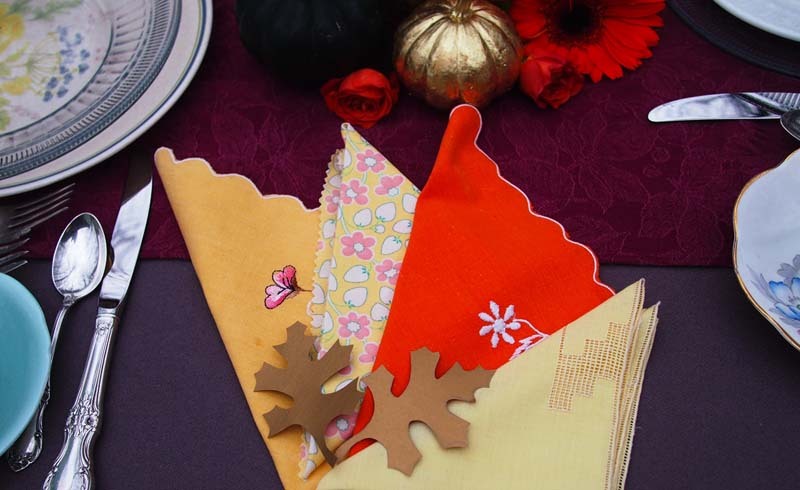 Cloth napkins give pops of color with a luxurious feel. Don’t have enough for all your guests? Just hem (or trim with scissors or pinking shears) the fabrics of your choice into squares. 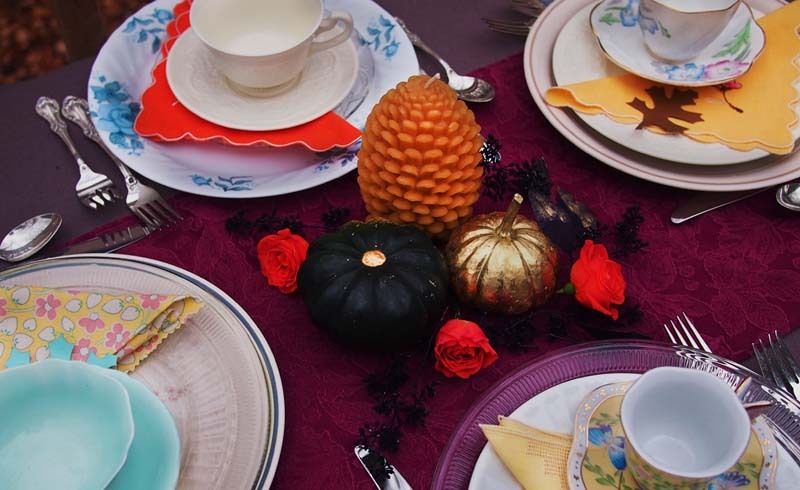 The table setting pictured mixes vintage and homemade napkins in a similar color scheme. 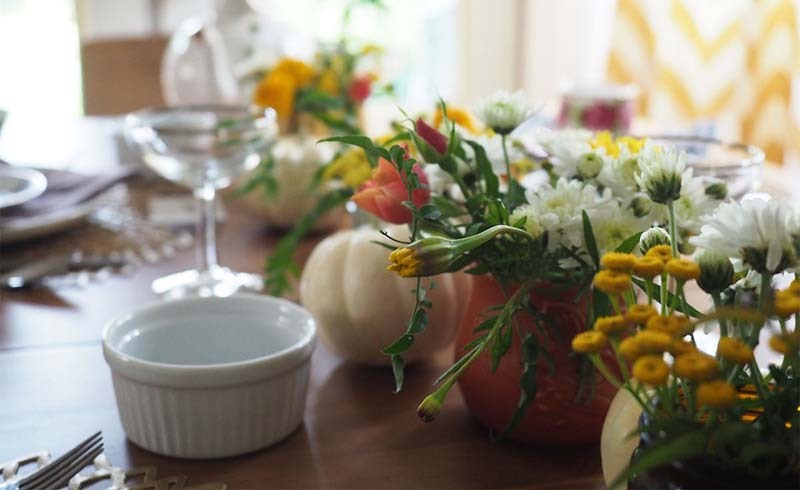 This is your chance to create a beautiful table setting that’s unique to your home. Try different arrangements of your china, teacups, glasses, napkins and flatware until you like the result. At the end of the day, holiday entertaining is about time with family and friends! Free yourself from the stress of creating a perfectly uniform look and enjoy setting the table for a joyous celebration.